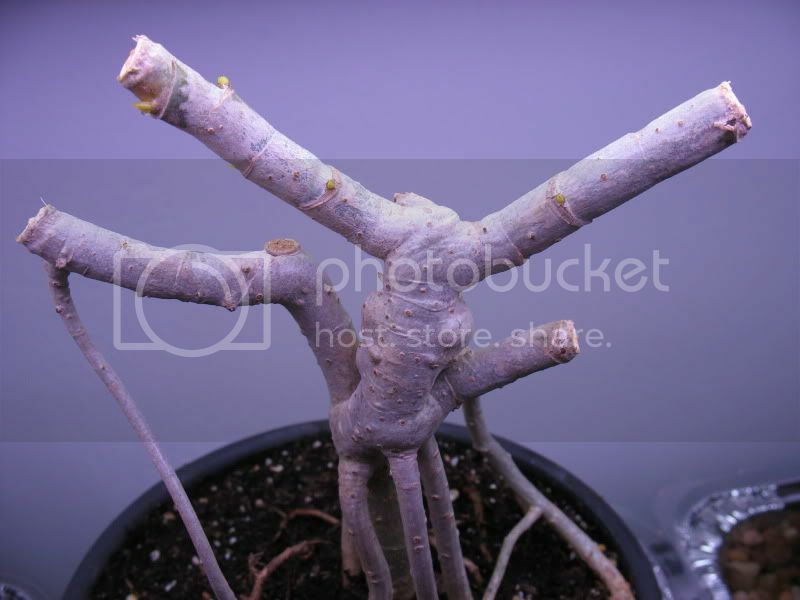 The plants don't quite look like 'bonsai,' do they? A tad bit large, wouldn't you say? This is because they were all recently purchased from 6" to 10" pots from Lowes and Home Depot. As you can see, I've incorporated indoor lighting into this project. Each of the two plant shelves has a 36" dual-tube fluorescent fixture (each contains one 30 Watt mid-spectrum---6,500K tube and one 25 Watt 'purplish' tube---which I'm guessing is more along the lines of 10,000K?). I used to use these over fish tanks for aquatic plants. In person it appears much brighter, and I think a lot of it has to do with the camera's ability (inability?) to adjust to the ample lighting coming in from the nearby patio door and adjacent window. This is my very first experience in getting into indoor bonsai, and I've still got a LOT to learn. Comments/questions welcome and much appreciated! I would say you are off to a very good start. Thank-you Phil, I appreciate your input. Now I just need to wait for some growth...don't we all? 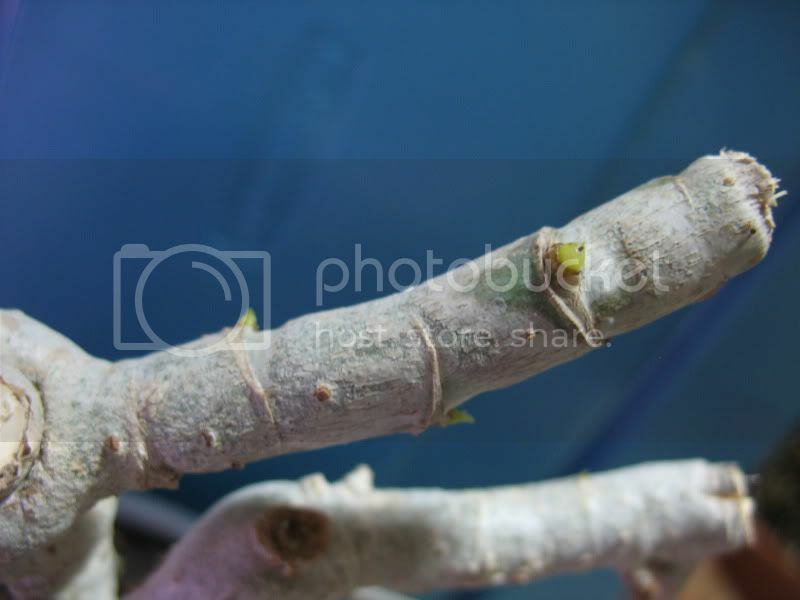 LOL waiting for new growth is how I got so many Bonsai. Waiting for one Bonsai to grow I might as well start a new Bonsai while I wait. Pretty soon you got lots of Bonsai and no time. I'm not exactly crunched for time at the moment, so that's not a concern (at least not for the time being)...BUT, are 6-8 individual plants (what you see in my pic) enough? In other words, I don't feel I'm limiting myself by choosing only the one species to work with. And the more I think about it, I only really have the space to deal with what you see in the photo I posted. 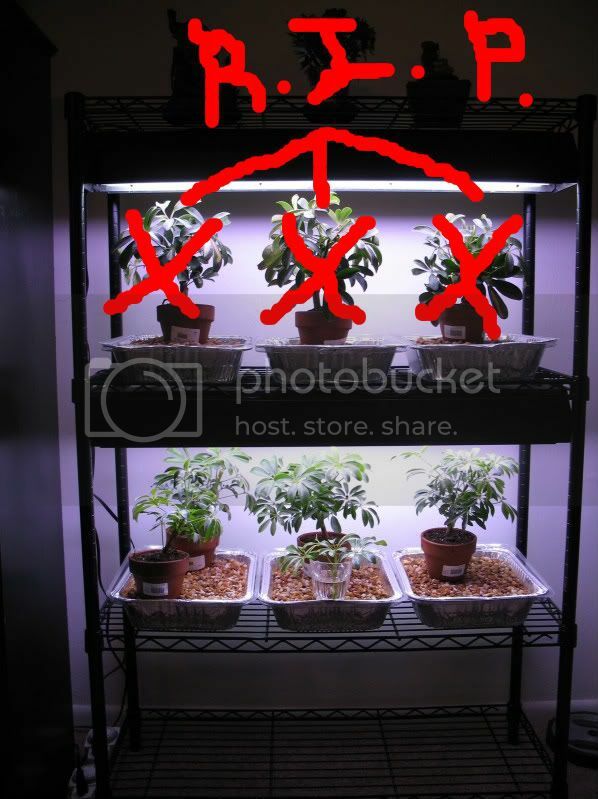 Seems like I'm answering my own question here, but I guess what I'm ultimately wondering is if having 'only' 6-8 plants (which I intend to have for the "long-haul") is setting myself up for disappointment (and regret in the sense that I will one day wish I would have started this journey with more plants)? Okay, thanks for the vote of confidence. One of the plants has really been catching my attention, and even at this very early stage I can already say that it's my favorite of the bunch. I took some extra time to envision how I'd go about shaping it into the form I have in mind for it, and I realized it was going to take quite a bit of meticulous work (and patience, of course!). And I'm sure the same holds true for all of the plants! 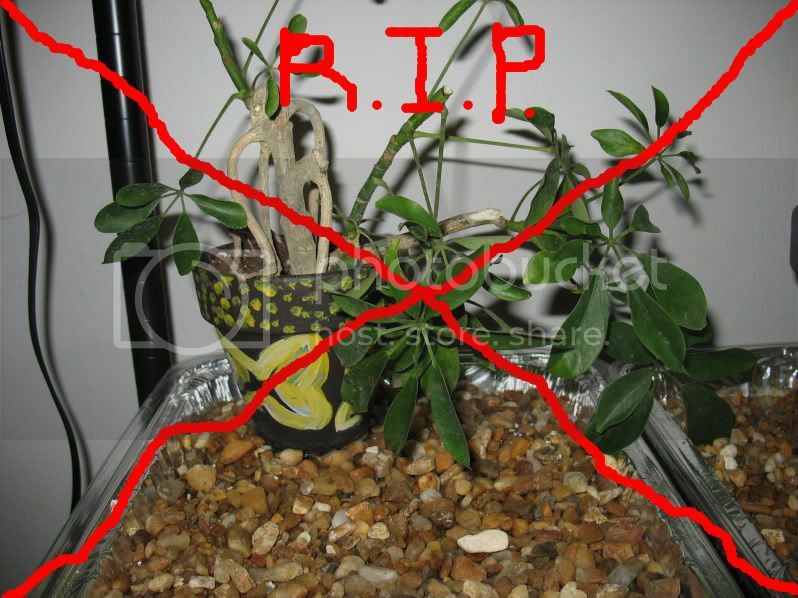 Sadly, one of the plants died (top right in the pic). 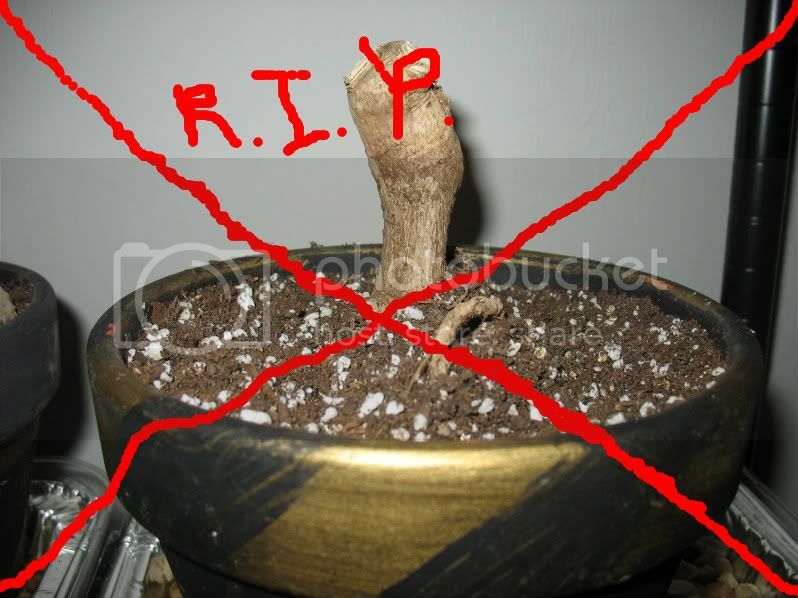 I'm thinking 'transplant shock' and severe 'root-pruning shock' about sums up the cause of death. Good news is that the 6 remaining plants (4 regular green; 2 variegated) have all responded to their indoor fluorescent lighting setup and most of them are showing several new growth points. 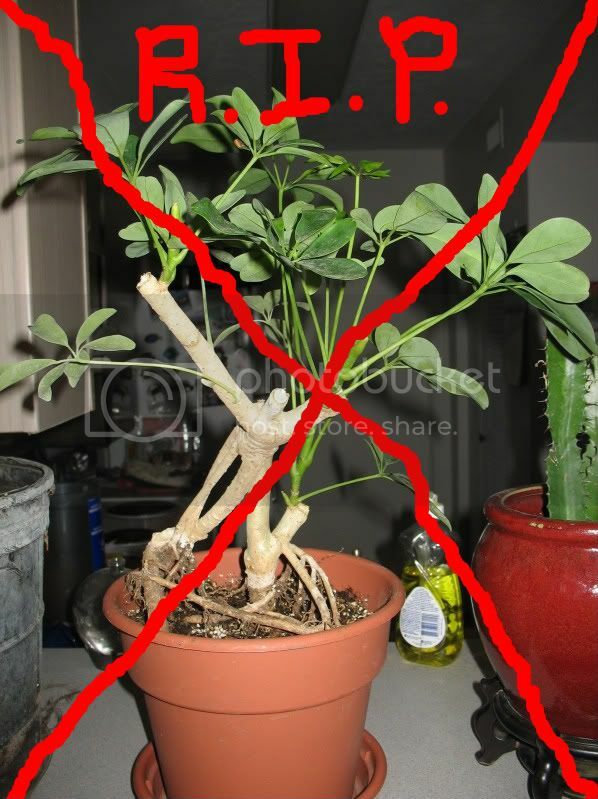 'Extra-good' news is that I just got a call from the local bonsai club president, and he's going to bring his "dwarf scheff" (Schefflera arboricola...the same as what I'm growing) to MY very first bonsai club meeting tomorrow morning! He said this meeting would be a time for everyone to bring in a tree to show off and/or basically get whatever advice they need on anything, so I'll definitely bring one of mine in! I'll be attending a juniper workshop next month---already have my tree and everything, so I guess I won't be limiting myself to tropicals after all! Yes, I cut back severely and completely defoliated the thing...hope it grows back. I hope to keep this 'trunk' base (which is actually mostly aerial roots which have established themselves in the soil and thickened-up) exposed with a lush, compact canopy on top. 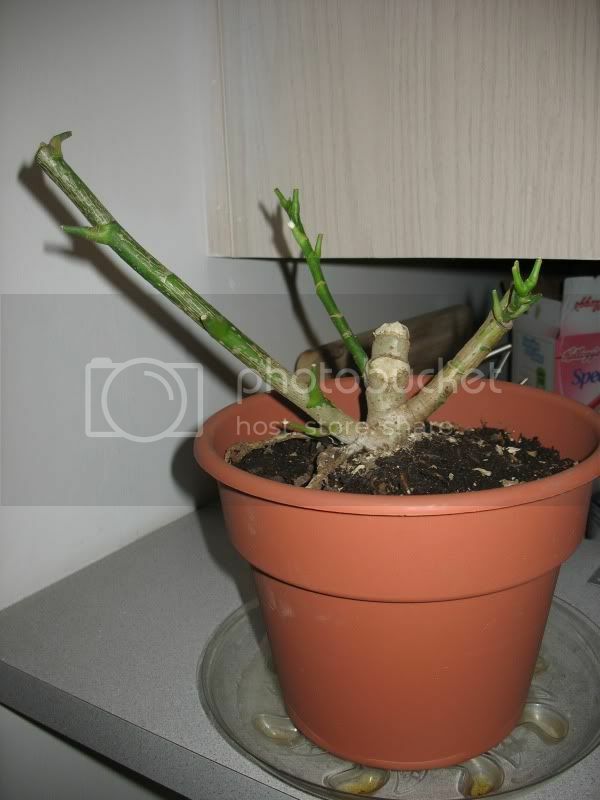 Cut this one back severely as well, but decided to keep the one growing stem just to make sure it stays alive. I hope to turn this one into a broom-style canopy. This one has an interesting trunk and exposed aerial roots, and the branch on the right screams to me "semi-cascade" for this fellow. Finally, here are two views of another heavily aerial-rooted specimen. It is a bit larger than what I'd ideally like to work with, but it caught my eye, so I decided to go for it. I'll let you guys (hopefully) give some feedback before I share any news about the original (smaller/younger) plants I posted at the start of this thread. All I can say is you've managed to do more with your bonsais in 2 weeks than I have with mine in almost 2 years. I ditched most of the younger plants (in first pic at start of thread). I have learned more about these plants and how better to care for them and prepare them for bonsai training over the past weeks of working with them. I've also done more research; paying very careful attention to David Fukumoto's techniques with this particular species. Accordingly, I have restarted with some younger specimens which will remain with me over the long-haul. I'll take my time with these new ones, now that I know more about what I'm doing. 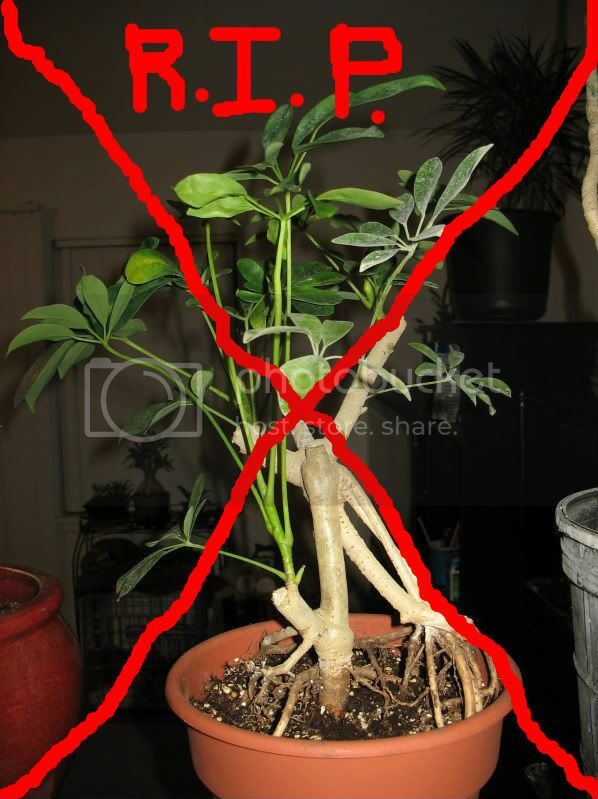 bonsaiboy wrote: All I can say is you've managed to do more with your bonsais in 2 weeks than I have with mine in almost 2 years. LMAO...yeah, I kinda 'cheated' a bit by getting older plants, didn't I? 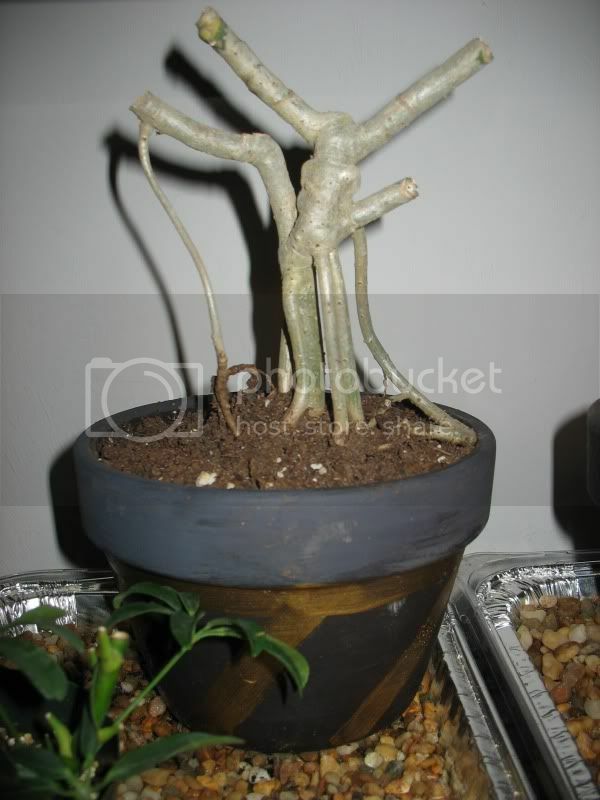 IndorBonsai...yes, it sure does help when the plants grow quickly! I'll continue to update on these older plants here, but the new project I mentioned will be in another thread (coming soon). Here's an update on my favorite 'older' plant of the bunch which I collected from a nursery (and cut back severely) within the past couple weeks. 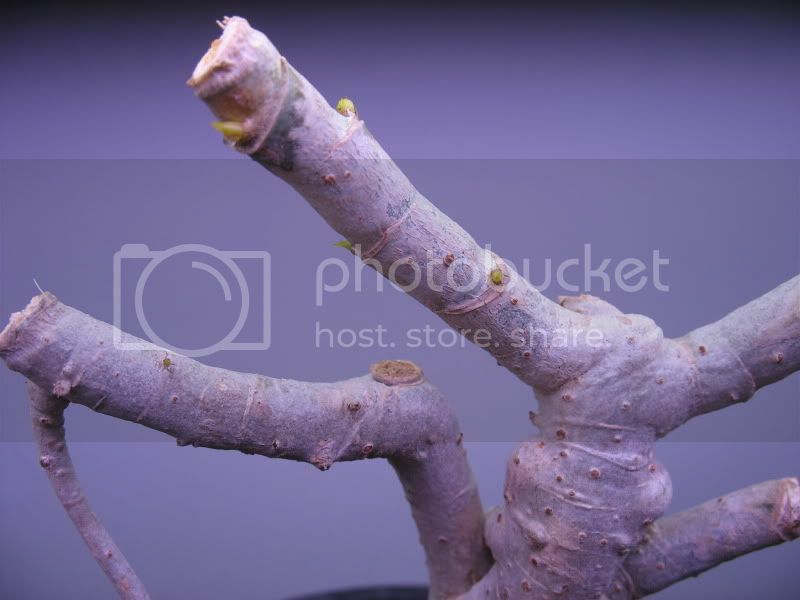 Click on the pics and check out the new growth points (emerging buds)! 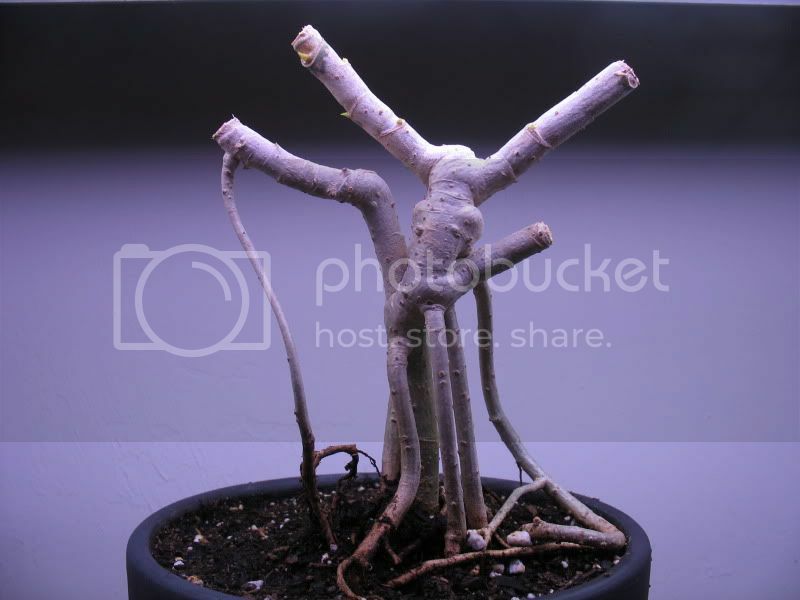 I love the unique shape of the exposed wood (trunk/aerial roots), and therefore my goal will be to keep it as visible as possible as I establish a lush, wide canopy over the top. 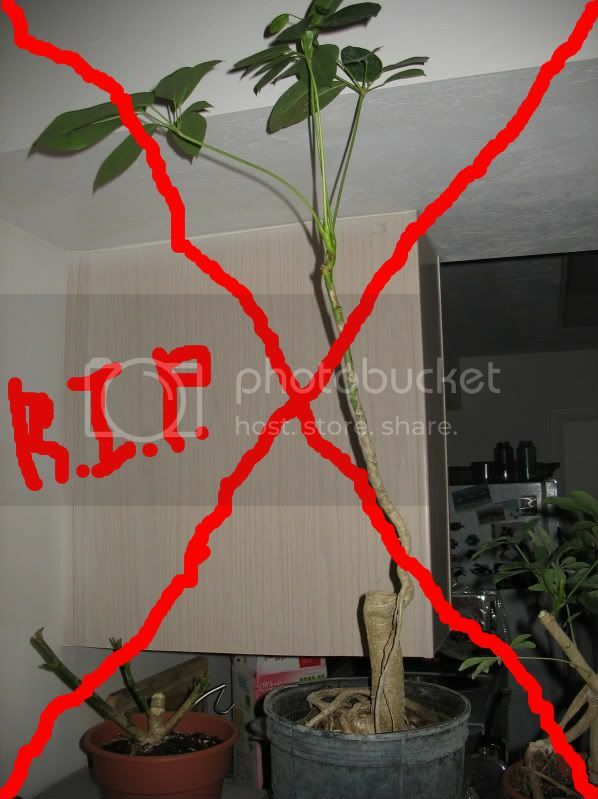 Just bought my first bonsai: Arboricola Schefflera!